Born at Winnipeg on 31 August 1915, son of Francis Scott Fultz and Florence Emma Preston, he served with distinction in the Second World War with the Royal Winnipeg Rifles and the Argyll and Sutherland Highlanders of Canada, leaving the service with the rank of Major. After the war, he became a Counsellor and the first President of the Canadian Cancer Society (Fort Garry Unit) and the Fort Garry Chamber of Commerce. He worked with the Fort Garry Legion to establish transportation for senior citizens and also served as a board member for Meals on Wheels. In 1952, Fultz founded Fort Garry Realty Company, and served as a President of the Winnipeg Real Estate Board. For his services, he was given the Fort Garry Order of the Gate in 1971 and a Fort Garry Legion Life Membership in 1981. He received the Legion Meritorious Service Medal and was a past Legionnaire of the Year. 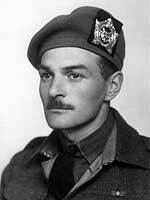 He died at Fort Garry on 1 February 1988. Obituary, Winnipeg Free Press, Friday, 5 February 1988, page 38. We thank Dennis R. King for providing additional information used in this profile.